Did You Know There’s an Actual Oregon Music Hall of Fame in West Linn? Now, newly-minted members of the OMHOF have reason to believe the honor shall endure for longer than the induction ceremony itself. The physical Oregon Music Hall of Fame is housed inside the home of the Youth Music Project in West Linn. IMAGE: youthmusicproject.org. The 2017 crop of entrants to the Oregon Music Hall of Fame may have lacked a certain star power compared to years past, but news of the hall itself ended up stealing the show. At the 11th annual OMHOF gala, held October 14 at the Aladdin Theater, touring conflicts and a tragic uptick of posthumous awards further weakened the salability of a class already long on local heroes and niche icons. For the first time, though, newly-minted members of the Oregon Music Hall of Fame have reason to believe the honor shall endure for longer than the induction ceremony itself. After shepherding the institution through its first decade as a purely-virtual pantheon, Music Millennium owner Terry Currier announced the existence of an actual, tangible, brick-and-mortar Oregon Music Hall Of Fame, which pleasantly surprised past honorees and befuddled attendees unfamiliar with the non-profit's strict philanthropic focus. See Related: Music Millennium Owner Terry Currier Will Be Honored With Own Official Day This Weekend. Last year, Currier last year brokered an arrangement with the rock-oriented non-profit conservatory Youth Music Project. Columbia Sportswear scion Sally Bany and her husband, Dave, volunteered to personally finance an expansion of the Youth Music Project premises that made room for a dedicated OMHOF exhibit available to the public free of charge six days a week. "Originally," Currier said, "our goal was to combine the museum with an educational facility open to everyone. This one is just geared for kids. I also envisioned night time classes. In my head, the museum would have been much bigger—most likely 10 to 20 times its size—but we obtained part of the vision. The facility's different but still functions much like I imagined." 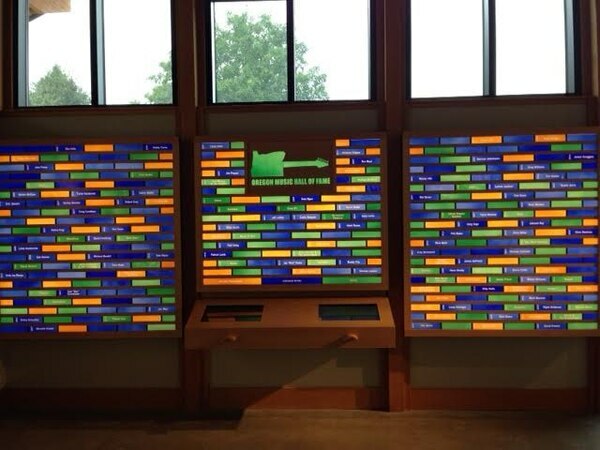 Inside the smallish space, a wall of stained-glass plaques have been inscribed with each inductee's name and colored to signify their category of eligibility. Interactive kiosks contain photos and information about every member. "The wall was made with the future in mind and has room for inductees for the next 18 years," Currier said. "Maintaining a museum is an expensive proposition, as the Oregon Sports Museum found out when it couldn't sustain itself downtown. This arrangement makes it possible for us not to staff it and incur those costs so what money we raise goes to music education." Despite limitations of space and a suburban setting rather far afield from most artists' stomping grounds, the Youth Music Project's playful kitsch-luxe aesthetic lends an EMP-styled flair—for example, that oversized Gibson Flying V sculpture buried neck-down in the site's front lawn—while the ready-made audience of kids arriving for subsidized lessons neatly confirms the guiding OMHOF ethos. As Sam Coomes, of 2017 OMHOF honoree Quasi, marveled during his acceptance speech, "it's a Hall of Fame for people who aren't even famous—which is pretty rad." 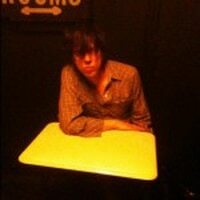 OMHOF Quasi from Jay Horton on Vimeo. At the end of the day, though the museum may be humbler than once intended, the true purpose of OMHOF has always been at least as concerned with supporting the next generation of artists as honoring their forebears. With negligible overhead and no paid staff members, the non-profit has been able to bestow scholarships upon a few musically-inclined college-bound Oregon high school students each year. Past beneficiaries have included YouTube sensation Kate Davis and recent Julliard grad Lake Jiroudek—the only guitarist accepted by the esteemed music school in his first year—but Currier believes it's too early to really expect career success. "As far as scholarship recipients from the past, some are doing well in music, but the program has not been going long enough to really see yet," he said. "They're in school for four years or more, and we've only been giving the scholarships for about eight years." Currier recently retired from the board to aid family members' medical issues, but he remains a guiding figure—the class of '18 ballot committee has begun assembling under his watch—and an irreplaceable asset for enlisting artists, venues and media outlets to help the museum's cause. "Back in the 60's and 70's, all schools had music programs. I would have gone to college on music scholarships had I not started working in a record store the beginning of my senior year of high school," Currier said. "Forty-five years later, here I am. If I could make it happen, every school in the state would have a music program, but it takes organizations like OMHOF to help make that a reality." 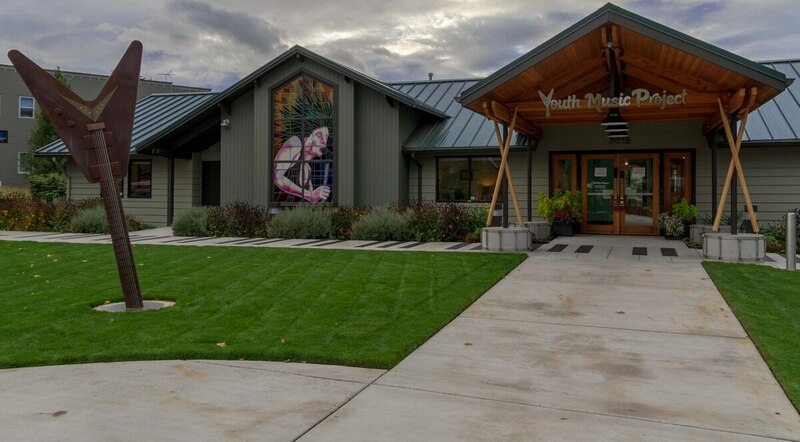 The Oregon Music Hall of Fame is located inside the Youth Music Project, 2015 8th Ave., West Linn. Open 10 am-7:30 pm Monday-Thursday, 10 am-5 pm Friday and 9:30 am-3 pm Saturday.